Fill a large box and send it to the Philippines. Box size: 70x45x55 cm (a lot larger than a moving box). 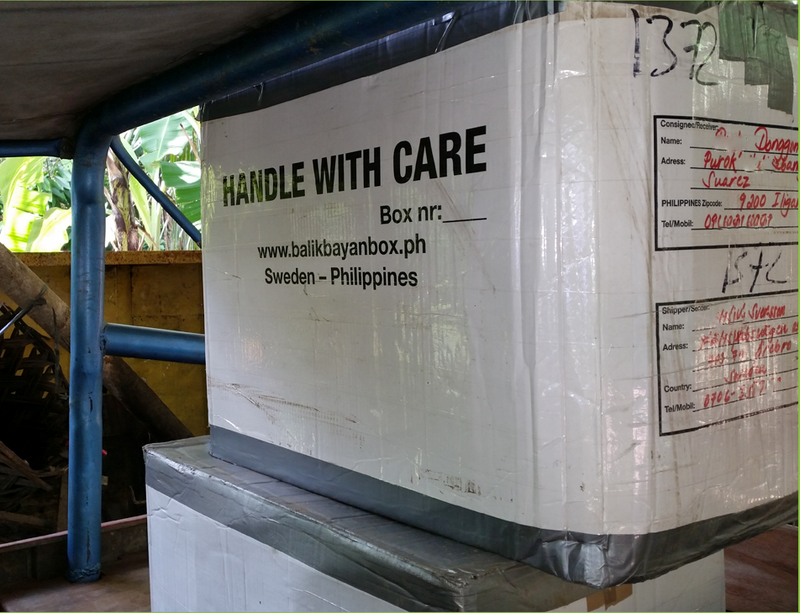 Please contact Michel alternatively by phone (0702-14 17 99) or e-mail balikbayanbox@sarisaristore.se or a text message to 0706333963 for balikbayan box in the Örebro-area. SEK 1100 for big box to anywhere in the Philippines. You receive a box from us. You pack your box at home and either you take it to us or we pick it up from you. You can fill your box up but please consider that the box is manually handled, a rule of thumb is that you should be able to lift your own box to the pick-up car. When we receive your packed box, you pay for the service (only after you decided to actually send your packed box). Your box is shipped to the Philippines and delivered to the address that you've put on the box. The price is the same to wherever you decide to send your box in the Philippines. The delivery time may vary but is approximately three months from Sweden to the Philippines. All of this is included in the SEK 1100. Download the shippers declaration that is to be printed, completed, signed and attached to each box. Please note that we only handle the Örebro-area.